Today on our tennis blog we will see some concepts of basic technique while playing. Specifically, we will explain what are the types and effects of the tennis ball. We understand the reflection of the rotation printed to the ball in the stroke, it would not be unwise to consider that a flat stroke is a blow without effect. When hitting the ball, the force used is divided in two ways. A part of it passes in the translation or displacement of the ball forward and the other part passes in the rotation of the ball on itself. The amount of effect the ball carries is determined by the speed of the turn. The flat ball has no rotation, which is the strongest or fastest blow of all, but it is also the most difficult to control. On this occasion, we are going to talk about something as fundamental as tennis balls and we are going to explain the different types of tennis balls there are. How should tennis balls be? There are many peculiarities around how tennis balls should be in official competition . They must be yellow in order to facilitate the viewing of the players and spectators on television, without stitching at the seams, with a weight ranging between 56 and 59.4 grams and a diameter between 65 and 68 millimeters. Ball type 1 (fast speed and that should be used for low speed surfaces). Ball type 2 (medium speed and used on surfaces of similar speed) Can be pressure or depressurized. Ball type 3 (slow speed for fast speed surfaces). There are also types of balls that have to do with the level of each player . For example, beginners use soft core balls, lighter and that allow much more control (sometimes they are foam balls) and striking colors. For occasional players we have balls without pressure, heavier and harder than the previous ones and made with rubber and felt. For professional players , pressure balls are used, which usually do not last long. 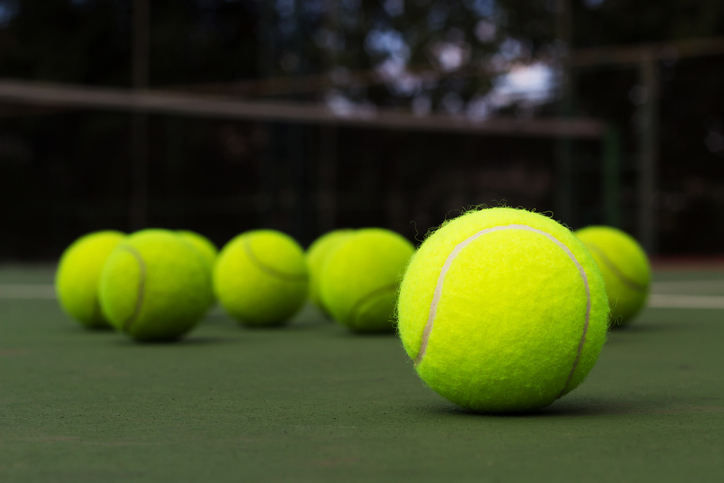 Normally the tennis balls that are usually used for any type of competition in sports, training, and classes in tennis clubs are pressurized balls . As it receives the blows, the pressure decreases as it loses air. This change in pressure causes the behavior of the ball to change, hence in a tennis match, it is necessary to change constantly and pass to new balls. The player who starts for the first time with this type of balls must warn against it. And be conscious of the types of tennis courts. Because game can change any time with a situation. Finally, a detail to take into account: there are also a type of tennis balls that are balls without pressure that are used in games that are disputed to more than 1,219 meters above sea level (with an acclimatization at this height of at least 60 days before the tournament), in various clubs as it is a long-term ball or due to the weather. If the ball rotates in the same direction as its displacement (see drawing 1, then that blow is topspin) When the ball bounces, it will take more height than a flat shot (see drawing 2). If the ball rotates in the opposite direction of its displacement (see drawing 3), then it is a cut shot. When the ball bounces, it will have a lower pot than a flat shot (see drawing 2). Depending on the amount of effect that the ball carries, the cut between “slice” and “chop” is subtly differentiated. The ball can be given a lateral effect, both from the outside in and from the near side of the body. These effects have no specific name but could be classified in the cut family. These blows were used by players like Jimmy Connors or Ivan Lendl among others. Although they have the same names, that is to say, cut or flat, a difference is observed and that is that the ball can take something more of the lateral effect than in the other blows. The cut is stuck from top to bottom and from outside to inside. Botara little and will go to the left (for a right-hander). The topspin sticks from bottom to top and from the inside out. Boot high and go to the right (for a right-hander).